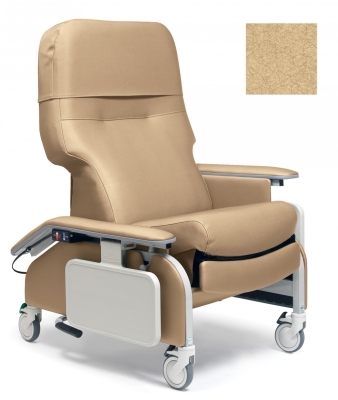 The Series FR577RG and FR577RGH Recliners feature three positions for patient comfort. 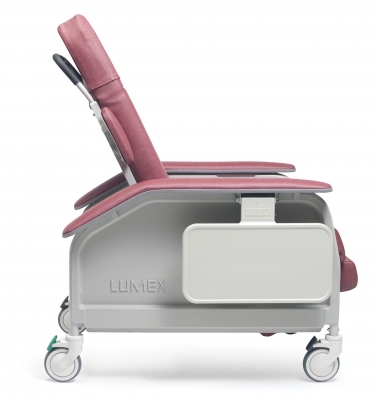 The fourth position is a Trendelenburg (or Shock) Position that must be activated by a caregiver — the Trendelenburg Position CANNOT be activated by a patient while in the recliner. 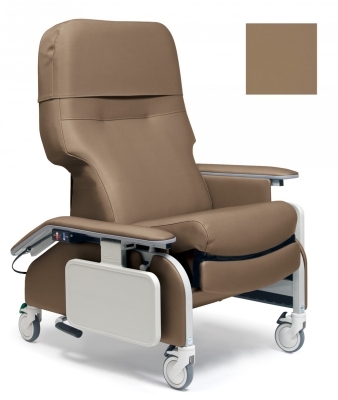 In addition, the Series FR577RG features a back that can be repositioned via the Adjustment Lever located on the Push Handle on the back of the recliner. The first position is the Upright Position. This position is ideal for patient transport and can be used to initiate patient treatment / therapy. The third position is the Second Recline Position and is also known as the “Full Recline” position. This position is ideal for patient treatment, rest and reading. Improved wider and softer armrest for patient comfort. Four Tente® swivel casters facilitate transport and maneuverability in confined areas. Three total locking casters with easy to locate black locking tab lock wheel and swivel with single motion. Directional wheel lock with high visibility green tab allows recliner to track straighter with less effort during transport. Available With Heat and Massage Option.